As Pooh would say, "Oh, bother." Calvin: What do you do, wait until you see the whites of my eyes?! Hobbes: You should've seen them! They were as big as dinner plates! A good sign that a character is absolutely terrified is if their eyes are bulging wide open and the irises and pupils are visibly shrunken, or even absent. This gives the impression that the character is screaming inwardly, even if they're speechless with shock. It comes across as striking and, if done well, can even be scary. Often a warning sign that the character is about to freak out. May also involve Tears of Fear. Can also happen if a character is badly injured, with bonus points if the scene cuts away to a Scream Discretion Shot. On the flip side, it can also be used when a character is very, very angry. A very minor case of Artistic License  Biology: while the pupil inside the iris can indeed shrink due to fear, the iris itself does not. Regardless, most artists consider it an Acceptable Break from Reality (see Open the Iris for reasons why).note That being said, a lot of examples feature cartoon characters whose eyes are only white circles with a black spot in the middle; and for them it's unclear if they have only a pupil and no iris at all, or very small irises the same color as their pupil. Frequently overlaps with Oh, Crap!. In Anime, this may be replaced with Blank White Eyes instead. Contrast Open the Iris, the trope's physical opposite. If this effect only happens to one eye and not the other, it's a case of Mad Eyes. Not to be confused with Sphere Eyes, which always look like dots. Most characters on Higurashi: When They Cry do this when they're really scared, but Satoko has a habit of giving particularly haunting moments. One of these is Satoko's reaction to Keichii standing by her best friend's corpse in Tatarigoroshi-hen. Satoko freaks out, believing that Keichii was responsible, and while doing so, gives a picture perfect demonstration of the trope. Her reaction upon getting out of the river and returning to her school and finding her friends dead elicits this reaction from her as well, and it is also the expression her classmates are wearing. Gives a truly ghoulish impression. Keichii does it a few times as well. It's also used fairy often to show a character is going Ax-Crazy, to the point that most instances of Nightmare Face in the series include this. Happens on a regular basis in the Bleach anime, usually when one character is impressed by another character's power/abilities. And Arisawa does this in chapter 410 when Aizen states he intends to kill her and draws his blade. Inverted by Maka and sometimes Black☆Star in Soul Eater; their pupils are invisible unless they're particularly shocked or angry. Everyone else in the series plays this straight. Most Code Geass characters do this, resulting in some pretty disturbing faces. Occurs often in One Piece- in Oda's art style, the shrunken irises are often split into two half-circles with a tiny dot in between for the pupil. Most others get a mix between anger and fear, but Luffy's is almost always rage when this happens. This notably happens only for the male characters. The female characters (and sometimes Chopper) avert this trope, because even though their eyes widen, their irises (which gain thicker outlines) and pupils stay the same size. In addition, their irises become white (only in the manga. In the anime, their irises gain a lighter shade of their regular eye color) and lose their shine. 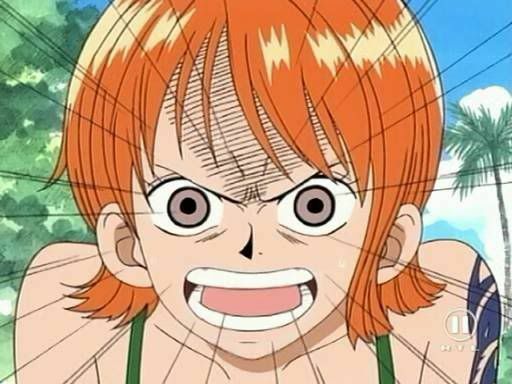 For example, here's an image of a very angry Nami ◊. Neon Genesis Evangelion has some moments with this trope, especially when Shinji freaks out in End of Evangelion, upon seeing Asuka's dismembered Eva Unit . Epic Freak Out ensues, and again shortly after upon seeing the Giant Naked Rei/Lilith. Shaman King characters tend to do this, along with sporting white-colored irises for that instant. The OEL Manga My Cat Loki features this whenever the titular cat Loki is scared. Part of an Oh, Crap! moment for the villain of Domu by Katsuhiro Otomo. Reaches epic levels insofar as it is a silent panel the size of an entire two-page spread. In My Hero Academia, All Might himself develops these after hearing from All For One that Tomura Shigaraki is the grandson of All Might's mentor; Nana Shimura. What follows is All Might suffering a huge Heroic BSoD during the fight. Since most of Kakashi's face is permanently hidden (usually just the one eye is left clear), this is what allows us to notice he's having an Oh, Crap! moment. Naruto himself gets a noteworthy set of these when Hinata gives him her Anguished Declaration of Love just before almost getting killed by Pain. Notable in that they are not momentary; he is so shocked, he has them for the ENTIRE SCENE. And then he, quite understandably, goes berserk. Oh boy, does he. In Death Note, Light does this several times - most noticeably after he realizes the titular notebook is for real. Also, Light gets them when he's starting to go insane. Mello also does this all the time. Dragonball Z already has most characters displaying proportionately small irises/pupils, but when they're frightened or under stress, their pupils shrink to pinpricks &/or go white. In Magical Girl Lyrical Nanoha Strikers, we have Quattro(see the anime image for Oh, Crap! ), who has a very good reason to be terrified. Edward Elric does this a lot in Fullmetal Alchemist. Accelerator of A Certain Magical Index does this quite a lot (because of his insanity) but the most prominent is when Amai Ao is about to shoot him in the head and he knows he won't be able to deflect it. 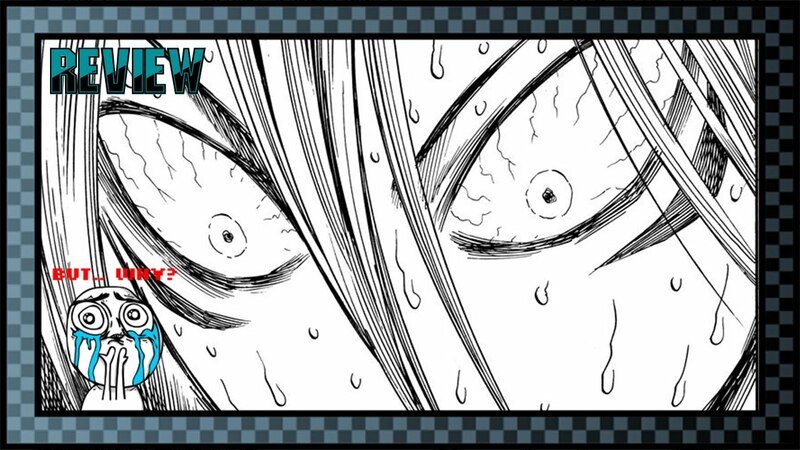 Most Fairy Tail characters inverts this for their pupils are usually invisible unless shocked or angry. In Mobile Suit Gundam Wing, it happens to Relena when Heero raises his gun to her at the end of Episode 2. Of course, she's saved from his Ineffectual Death Threats by a Duo Ex Machina. Saionji does this in Revolutionary Girl Utena during a duel, not to indicate fear or shock, but focus on defeating his opponent. The quick shift makes him appear deranged and potentially murderous. Yuno Gasai has some horrifying examples in the anime version of Future Diary. Bonus points when she's smiling or laughing maniacally. This happens on occasion in Axis Powers Hetalia, such as when Germany sees that the invading aliens have rendered his tanks useless in The Movie. In Digimon Tamers, Guilmon is a childlike, friendly dinosaur Mon. He's also crazy powerful by Rookie-level standardsnote Actually common in Tamers, where Rookie Digimon are quite capable instead of Sleep-Mode Size; even Terriermon, who is the size of Digimon Adventure rookies, is a Pintsized Powerhouse who can clobber you with a frikkin' tornado. and when in a battle mindset can be feral and scary even to his friends. The signal that you should stop d'awwing over him and get out of his way in a big hurry is when his pupils suddenly shrink to pinpoints. An understandable reaction ◊ from "Speed O' Sound" Sonic running junk-first into the fist of the titular One-Punch Man in the anime. Yes, it's Sonic's fault because he's the belligerent loony while Saitama comes off as sharp as his head. Popuko of Pop Team Epic naturally has wide eyes, but when she gets angry (which happens very easily), her irises shrink to the size of periods. Happens to Vicious in Cowboy Bebop when Spike shoots him during their final duel. Qwackerjack in the Darkwing Duck comic, after the Crimebots mention Negaduck. Shadowcat busts this expression out for a full four panels in X-Men Forever after Wolverine, who is supposed to be dead, ends up impaling her with his bone claws from the back. In a Ghost Rider tie-in to World War Hulk, Doctor Strange gets these when the Ghost Rider spirit takes over from Johnny Blaze. Blaze might have defeated the Hulk and saved the Illuminati, but the Ghost Rider decides Hulk is in the right and rides away. This happens in Godzilla Rulers of Earth when Godzilla sees a Destoroyah juvenile kill a man in front of him. As noted in the Page Quote, this happens to Calvin frequently when Hobbes attacks him. Calvin and Hobbes: The Series occasionally has this. The Princess and the Frog: Facilier during the reprise of "Are You Ready?" Also the leader of the frog hunters after Ray flies up his nose and when he gets the crotch of his pants blasted off. Darla Dimple in Cats Don't Dance does this at the end when she sees that her attempt at sabotaging Danny's show actually improved it. This happens to the Thief in The Thief and the Cobbler when he realizes his hands are about to be chopped off. Meowrice does this a couple times in Gay Purree first when Juane Tom catches up to him while he's making his get away with the kidnapped Mewsette on a train, then later when Robespierre bites his tail. 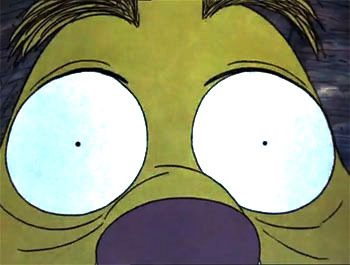 Providing the page image, Rabbit's memorable freakout scene during The Many Adventures of Winnie the Pooh, which was fittingly animated by Don Bluth. Flik does this in A Bug's Life when he figures out his 'warriors' are really just circus performers. Thumper does this too in his Oh, Crap! moment when Dim roars at him. Scar in The Lion King does this shortly before he is eaten by hyenas. Simba did it, too... just before a stampede rains down on him. Mr. Potato Head in Toy Story does this right before RC slams into him. Happens in Monsters, Inc. when Mike and Sulley see Boo running through the restaurant. Mickey Mouse does this in Mickey's Twice Upon a Christmas during the Disaster Dominoes sequence of Pluto wrecking his decorations. Happens to Mickey Mouse in Mickey, Donald, Goofy: The Three Musketeers when he is trapped in a dungeon that begins to flood and fully realizes the danger he is in when he sees an inscription high up on the wall reading "You Must Be This Tall to Survive This Dungeon". In Help, I'm A Fish!, Fly's eyes do this just as a crab slashes one of its claws at him and slices his side open. A rare realistic depiction in Paranorman. Norman gets a vision of the famous witch trial of Blithe Hollow, in the position of the accused. Norman tries to defend himself, until he hears someone behind him, crying. His irises narrowing ◊ in shock is a nice touch to The Reveal that the "witch" was a little girl who talked to ghosts. In Aladdin and the King of Thieves, this was the giant turtle island's reaction when Genie entered inside it as a distraction. It occurs in ¡Three Amigos!! during the duel between Ned Nederlander and that German guy. Psycho: Marion Crane's eyes do this, though in an Artistic License  Biology moment. This happens to Jessica Rabbit in Who Framed Roger Rabbit, in the only scene where you really get a good look at both her eyes ("Oh my God, it's DIIIIIIP!"). And, indeed, her face looks more childlike (symbolizing her fundamental fear of Dip), and loses its more mature look, much like how many other toons do when faced with an instinctual fear. Judge Doom also has this look when he sees the Dip nozzle pointed at him was just turned on. Happened in the American version of The Ring with a very good close up of Rachel's eyes when viewing the cursed tape for the first time. In Muppet Treasure Island, Kermit shrinks his eye irises during a heavy load on Benjamina Gunn at the cliff. It's an easy to miss moment in Pirates of the Caribbean: The Curse of the Black Pearl, but it's done by Elizabeth when she first sees the crew of the Black Pearl under the moonlight. This happens to the animated Cruella DeVil in the video game Roger made in the live action 101 Dalmatians movie when a keg of dynamite is thrown at her. Large Marge's Nightmare Face from Pee-wee's Big Adventure. In Dragon Bones, Oreg, who is magically bound to Ward, gets increasingly uncomfortable when Ward is too far away. After they have been separated for a considerable amount of time, Oreg's pupils are described as "small as the points of needles", and he's in a state of shock. In The Legend of Zelda: The Wind Waker, Link does this whenever he is hurt or surprised. In The Legend of Zelda: Twilight Princess, when Midna discovers the Mirror of Twilight has been broken, her eyes do this. Starting with the 3D remake of The Legend of Zelda: Majora's Mask and carrying over to The Legend of Zelda: Breath of the Wild, the Gorons do this when startled or shocked. It's notable because they otherwise have completely black eyes. Thane's eyes in Mass Effect end up looking a bit like this while he's having a flashback - it likely just has that effect due to the fact that his flashbacks are the only times his irises are easy to make out. Ollo In The Sunny Valley Fair: Ollo's first reaction to seeing the prize-winning tomato. Kaguya from Touhou does this at 02:15 , but it's not out of fear. Epic Mickey: Splatter the Shadow Blot with paint. No seriously, do it, it's priceless. 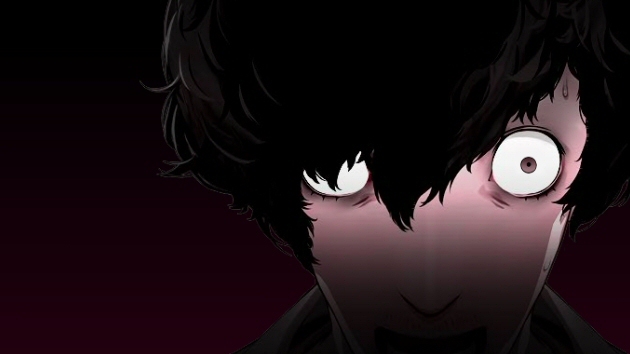 Vincent from Catherine pulls off a spectacular example ◊ for one of the promo arts of the game. World of Warcraft Cataclysm: Deathwing gives an absolutely beautiful example when he sees Thrall holding the Dragon Soul. Deathwing ''created'' the Dragon Soul, he knows perfectly well just how much damage it can do. It's probably the first time he showed anything besides rage in the game. This happens a lot in the Joe & Mac series. It occurs whenever Joe, Mac, the enemies, and even the bosses receive damage. It's especially funny in Joe & Mac 2 considering that the dinosaur bosses in that game look more realistic compared to the other entries in the series. In the animated short Night of the Werehog, a tie-in to Sonic Unleashed, when Sonic notices the full moon, the camera pans in close to his eyes, and we get a shot of his pupils shrinking in both fright and shock... you know, before the painful transformation into a werehog kicks in. Used to hilarious effect by Ludger in Tales of Xillia 2, after he tests out a mind-reading device on Musee and learns that she's a lot wackier then she lets on; the accompanying dumbfounded facial expression making it all the more priceless. However, it's also used in a serious fashion throughout the game, often as a result of a mortal wound. Male characters in the original Tales of Phantasia on the Super Famicom spot funny popping eyes when they take damage. The "Shocked" expression for characters in Final Fantasy V have notably small eyes with wide open mouths. When Toy Bonnie attacks the player character in Five Nights at Freddy's 2, his irises are noticeably smaller than normal. Used to varying effect in Yandere Simulator. In the case of Yandere-chan, they slowly shrink when the player gets a Game Over by way of Senpai rejecting her or a teacher expelling her. For everyone else, they appear in the same fashion when they see something bad happen (either you killing someone or happening across a corpse). If they see you commit a murder, but you get away with it, their irises remain shrunken as a way of saying that they know you killed someone and they're going to damage your reputation continuously by spreading the word of your crime around the school. The intro cinematic for Jazz Jackrabbit 2 shows the titular Jazz wreaking havoc on a few helpless mooks... before coming face to face with one three times his size. Cue the Oh Crap Face, before little brother Spaz bails him out. Yuri develops a habit of making her eyes look like this as she undergoes Sanity Slippage. Occasionally she throws in a nice big grin for good measure. At the end of Act 2, Natsuki gets these when she sees Yuri's decaying body, upon which she vomits and runs out of the room. In The Adventures of Dr. McNinja, the main character does just this when he is very, very angry . Lampshaded in the Alt Text. The expression The Order of the Stick characters make when they're scared sort of evokes this. Including for Xykon himself : the skeleton with Glowing Eyelights of Undeath suddenly gains Expressive Orbits. In Blip, Hester's irises are normally the size of saucers, so seeing them shrink to pinpricks really sells that she's in a state of shock. Souls in Jack have teeny irises, if they are unjudged or hellbound. Once they are judged ready for heaven, or if the hellbound seek redemption, the characters' irises get even bigger and more expressive than when they were alive. Corpses' eyes look like this as well. In The Other Grey Meat Pretty much every other strip. Homestuck gives us some of ◊ the ◊ best ◊ reaction ◊ shots ◊ ever ◊, courtesy of a few trolls. Pixie and Brutus: Randal the raccoon's fear after hearing Brutus threaten him for threatening Pixie comes across clearly thanks to very big eyes and pinpoint irises. Happens in Questionable Content, with lampshading by the author at least once. Black Mage does this a few times in 8-Bit Theater, though given the fact that his eyes glow like two little lights under his hat, its hard to really say if he's a true example, even if his eyes do visibly shrink. Also, the current page picture ◊ for Puff of Logic. In Last Res0rt, while still used as an expression of shock, these eyes along with a slightly agape mouth are the telltale sign that someone's under the Compelling Voice of a Celeste. Frequently used in Everyday Heroes; for example, here when Mr. Mighty is scaring off the homeless guy who came to rob a convenience store. Mark, of FreakAngels, exhibits classic tiny, tiny irises as he goes into his furious, terrified rant in Episode 0134. Gunnerkrigg Court had Kat eyes doing this when she was told about certain Power Tattoo. Repeated in a later scene that ends in a triple Beat Panel and deserves it. Annie gets her turn on the last page of chapter 36. In 751 , Kat's eyes go from Black Bead Eyes, to this, to Blank White Eyes within three panels. When Tanna of Ears for Elves first sees Rolan (who is moving at high speed), her widened eyes, tiny irises, and high arched eyebrows indicate her surprise/shock. The black and white explosion-style background also shows suddenness. In Sequential Art, this often happens to Kat , who as Cat Folk normally has massive irises. In Savestate, Riley has this reaction when she first meets Harvey. In TwoKinds when the recently bed ridden and assumed dead King of an Asskicking Equals Authority people asks if you are challenging her decision, stand down. A pair of jerks in El Goonish Shive get such eyes after learning that Tedd (on whom one of them had clumsily hit) is not, as they thought, a girl. In Kill Six Billion Demons, the Master Swordsman Auntie Maya gets these while parrying a bullet. Rather than fear, it pairs with Dissonant Serenity to extremely unnerving effect. Zebra Girl: Crystal has this look when she is (presumably) falling to her death after being told that Sandra herself asked the vampires to kill her. In Larry: The Little Knight, Pup the wardog does this when Kickit feeds him alcohol and then bursts at over 60 miles an hour with Larry onboard. The Gmod Idiot Box episode 9 has Alex react this way when driven over the edge. As he stares motionlessly, one of the widened eyes actually falls out of his head, revealing his normal eyes underneath. The infamous statue Momo has this. In the episode of American Dad! where Roger tricks Steve into joining a drug manufacturing operation by telling him it's Hogwarts, towards the end of the episode Roger gets knocked face first into a pile of some unspecified drug. When he pulls his face out, his pupils first dilated rather large, and he proceeded to disarm and kill every thug attacking him, and shoot a bunch of rounds into the ceiling because we was wired. Then, with one thug left, Roger realizes he has run out of ammo to use against the last armed thug, which causes his eyes to shrink to a pinpoint, and him to touch the TV in the room and call "Ah, TV is base!" Inverted with Jet in Avatar: The Last Airbender when his Manchurian Agent brainwashing is triggered. Cleverly done when Azula first hears of the solar eclipse, her eyes stay the same size but her irises suddenly shrink. Other than this, she gives no outward indication of fear. 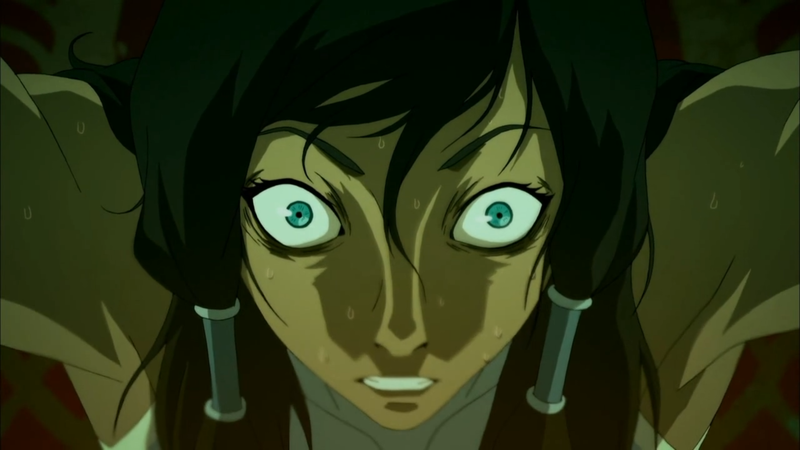 In the sequel comic The Search Azula is still more than a little crazy, which is shown with her eyes constantly being in this state. Mr. Herriman of Foster's Home for Imaginary Friends gets this way at the mere mention of dogs. Somewhat understandable considering he's, well, an anthropomorphic lop-eared rabbit. Likewise, Jimmy Two-Shoes uses this in similar situations. Kaeloo: In Episode 92, this is Mr. Cat's reaction to seeing the Grim Reaper when he opens the door. Kim Possible does this when her boyfriend reveals he's actually an evil synthodrone created by Dr. Drakken and tasers her in So the Drama. Tahno does this as Amon is taking his bending away, as does Korra. Yakone also does this when bloodbending. 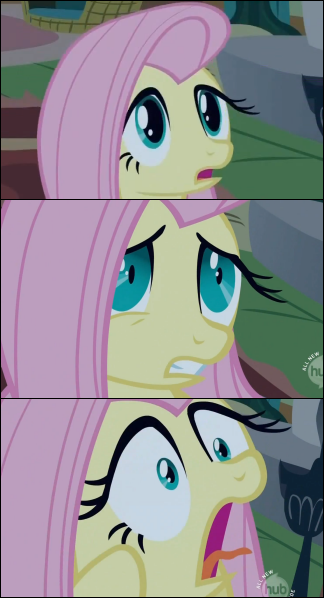 Happens pretty often in Life With Loopy when the characters are scared ◊. One of Chuck Jones' trade mark gags in his Looney Tunes shorts, some notable examples are in "Rabbit's Feat" before Wile E. Coyote gets hit by the train and Marc Anthony the bulldog when he fears for Pussyfoot's safety in "Feed The Kitty. Frequently seen as part of the heavy eye animation of My Little Pony: Friendship Is Magic. Sometimes combined ◊ with Open the Iris to express sinking terror. 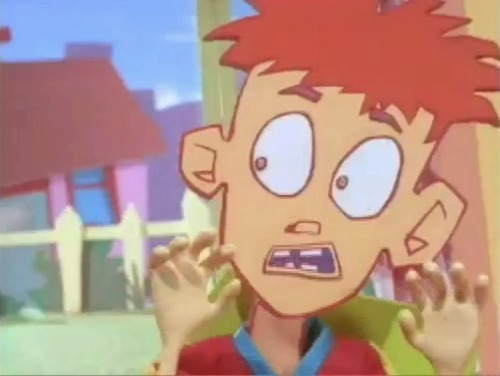 The Powerpuff Girls: Bubbles's pupils shrink in "Bubble Boy" when the Rowdyruff Boys try to force her to eat a roach. Used in Recess during a few Oh, Crap! moments, mostly in the earlier episodes. Gary does this when SpongeBob SquarePants tells him he's going to take a bath. (irises narrow to pinpricks) "Day...OOOOOOOOFFFFFFFFF?!?!?" Teen Titans' Beast Boy when he transforms into The Beast. Many Total Drama characters have big, expressive eyes, with irises that tend to shrink visibly during Oh, Crap! moments. Heather is the most prominent example, partly because she has the most expressive eyes of the entire cast and partly because she simply has more screen time than most. Used a lot in VeggieTales, especially during the Oh, Crap! moments. Star vs. the Forces of Evil: The show is usually known for its characters drawn with Large Pupils. But as an artistic style or storyboarder/character design choice, the character's eyes are drawn very small or with just small dots for the irises as a moment of worry or any weird expression.